Consumers demand superior support, valuing their service experiences so much that 86% say they will often pay more for a better experience. 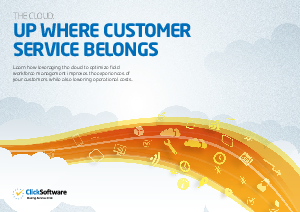 This eBook presents the value of providing superior customer service and how so many companies today prioritize investments in field service management. Readers will also learn the value of leveraging the cloud when deploying a field service optimization solution and how two market leaders in cloud solutions—ClickSoftware and salesforce.com—have partnered to create a real-time scheduling and mobility solution that allows companies to enhance customer service.